In 1946, the Nazi Occult Bureaus Project Vampir Sturm threatened to destroy the fragile peace following the end of the Second World War. A year later, the B.P.R.D. learns that there are creatures far olderand far more dangerousthan the Nazis creations, as a lone vampire nobleman ruthlessly hunts the survivors of the Third Reich. Joshua Dysart (B.P.R.D. 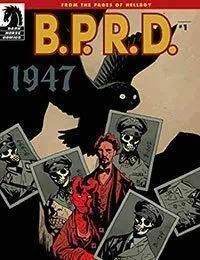 : 1946) and Hellboy creator Mike Mignola team up with Gabriel Ba (The Umbrella Academy) and Fabio Moon (Sugarshock) for a new chapter in the hidden history of the B.P.R.D.! A direct sequel to the critically acclaimed B.P.R.D. : 1946! Art by Eisner Award winners Fabio Moon and Gabriel Ba! **A chilling old-world vampire tale!